What would you do if you had a 2 minute preview of your future? What would that insight mean for you in the present day? Whether good news (a successful career, an unexpected relationship) or bad (a broken marriage, your own death), how will this information change how you act today? Should you take it as fact, as a future that is set in stone, as the main character, Lloyd Simcoe does? Or is the future whatever you make of it, free to bend and change according to your free will? And what if this future insight wasn't just given to you - but to everyone else on the planet? I could go on forever! And that's what was most intriguing about this novel: the philosophical ideas, questions, and dialogue that the premise brings up - and which every single human being in the story struggles to deal with - really captures your imagination. It makes you think about what you would do given information about your future, and how you would let that influence your life. Is that information a gift? A curse? Or does it even matter at all? Whether the future is set or not becomes one of the key storyline threads of the novel. And although time-travel conundrums and psychic insight have been a part of many stories, never have I read a story in which that future insight affects everyone on the planet. If there's one thing that this story lacked, it's tension. Philosophy and human relationships aside, you never truly feel like the characters in the story are in any real danger because of the Fastforward, or that the insight into the future has significantly changed the course, safety, or trajectories of their current, present lives. It is not until the final chapters of the book, when the story jumps ahead 20 years into the future and one of the main characters tries to avert his foretold murder, do things really get interesting - but by then, it's too late. 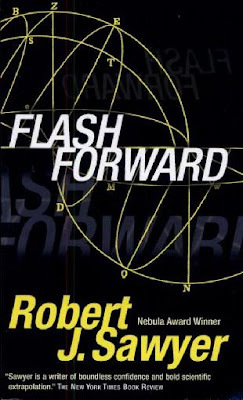 The TV Series - which diverges significantly from the setting of the book - at least builds tension from the start by making the source of the Flashforward a mystery and putting the cast in constant danger, which ends up working very well.